When Assassination Nation is at its best, writer/director Sam Levinson’s film plays out like a millennial version of Larry Clark and Harmony Korine’s 1995 film Kids; a harrowing but realistic depiction of what the teenage experience is in the advent of growing up with smartphones, sexting, drugs and partying as everyday events devoid of the label of taboo. This is where the film shines. It’s when the film tries to ascribe a Purge-like generational divide as a result of the older generation’s loss of privacy that the film actively loses its rails and becomes something much less than it started out as. 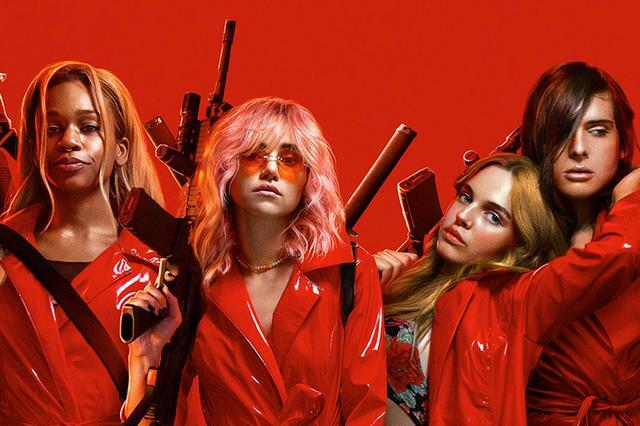 Assassination Nation follows the day-to-day life of Lily (Odessa Young), a whipsmart teenage feminist who knows the power of her sexuality but is nonetheless stuck in 2 dead end relationships. One, with her older boyfriend Mark (Bill Skarsgard of It and Castle Rock) who has started losing interest in her. The other with her sexting partner, Daddy (Joel McHale), who promises an escape from her boring existence in Salem. Lily’s gang of friends are her only other escape, consisting of Bex (Hari Nef), Em (Abra), and Sarah (a criminally wasted Suki Waterhouse). The film’s best scenes take place with Lily and her friends as they navigate through their sexuality, questions regarding sexting and privacy and Bex’s struggles as a teen queen while also being transgender. As this part of the film regarding their day to day lives plays out, the film’s A plot kicks in, as someone is hacking the phones of prominent citizens and releasing their contents online. While shocking, this doesn’t phase our protagonists too much until half of the town is hacked, minus Lily’s crew. This leads to a cross between The Purge and The Warriors by way of Charlottesville playing out. It becomes Lily and crew versus the town in a night of survival. This second half of the film, a lawless landscape inspired by The Purge by Female Prisoner Scorpion, doesn’t jive with the would-be post-millennial versus of Heathers the opening act sets up; it just doesn’t work. The film’s pacing drags when it should speed up and speeds up when it should linger. The film’s A plot is short-served completely to the point where it feels like two different films mashed together. This additionally leads to a weird tacked on ending segment straight out of Better Off Dead that feels like it is from a completely different film altogether. Its more jarring than endearing and ultimately makes Assassination Nation feel like a failed version of Gregg Araki’s The Doom Generation than its own unique film.